What does the future of work hold for us? 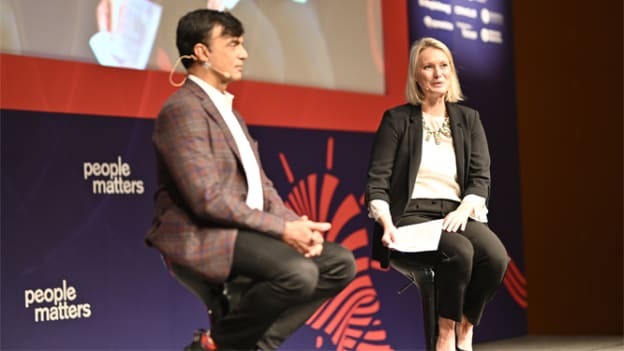 During People Matters TechHR Singapore, technology entrepreneur and investor, Rudy Karsan shares how to navigate through the new contours of work. With less optimistic reports floating across media, it is difficult to believe that any job is secure. Will Artificial Intelligence replace me? How do I prepare my workforce for automation? How can I possibly learn new skills? All of these questions and much more accumulate when pondering the Future of Work. Overcoming the anxiety associated with the Future of Work is the hardest obstacle that we are facing. Re-inventing the way work works is the priority for most organizations. As leaders, HR practitioners, researchers, and employees we all are anxious about what the Future of Work holds for us. So, instead of hiring strong and critical leaders to take decisions for us, talking about the computers that can write their code, robots that’ll take your order, and AI which can replace you, what are some actionable insights to eliminate this anxiety for the fast approaching Future of Work? You are not vulnerable yet! Michael Jordon is arguably one of the greatest athletes of all time. For more than a decade, he was the face of the NBA. And then he made the decision--a career change. Jordan was at the pinnacle of his success whan he walked away from Basketball. Not only did he walk away, but he did the unthinkable. He risked his career by trying to play baseball. Carol Dweck, author of Mindset highlights Jordan is a prime example of the growth mindset. A growth mindset where you embrace failure. You only reach the top and stay at the top by continually improving. Winning isn't everything. Growing is. Inculcating a growth mindset and the ability to hold different concepts (Failure & Success) in your head simultaneously would lead to winning. Making career decisions is extremely difficult at any age—be it at 15 years or be it 45 years. Wondering what the future holds is a tough question at any age. Instead of trying to figure it all out, one needs to get comfortable with the discomfort of uncertainty. Forget about your career path and career growth. Think about the experiences you faced in your journey. Most of the time we spend our time that people ask us to do which led us to view our life in two dimensions- Career and Time. Instead, replace your career with experience and your time with learning. This is the first step towards re-inventing the way we work. We are all blessed with the choices. The kind of choice we will make today will impact our future. Spending time on our learning, giving away the non-value addition tasks, immerse yourself into the experience. Creating a Not-to-Do list is based on the concept of inversion. Inversion is a strategy that looks at problems in reverse, to minimize the negatives instead of maximizing the positives. Maintaining a Not-to-Do list gives you a gift of time. It merely means making choices and stop doing things that don’t add value to your experience and learning.